A stir fry was just not going to cut it. Even though I didn’t have any hot leads on new and exciting restaurants, it was Sean’s 50th this week and time to go gourmet. Our old favorite, the Gramercy Tavern, was booked out – an excellent sign, so we waited-listed at the last minute with much positive energy and were rewarded with a timely cancellation. The menu was full of endangered words like jaggery, kohlrabi and deckle, and I would have avoided the smoked trout, cipollini puree and pickled onions as much as the sea urchins, had it not been for the sigh of the waiter exclaiming it was the best thing on the menu. I didn’t have time to taste everything, so I took his word for it, and what a bonus that was. The trout was smoked in-house with elegant subtlety and served with an equally discreet onion puree and beetroot coloured onion rings pickled to perfection. Maybe it was the time lapse since I had enjoyed such a work of art, or maybe it was the happiness of the day, but there was quite a pause and a few photographs before I could bring self to actually eat it. Not content with miracles just in food fare, I found the occasion of my husband’s birthday was also a milestone in the wine department. The Gramercy has an excellent list of wines by the glass, and in keeping with the locally sourced philosophy of the tavern, I tasted a sauvignon blanc from the North Fork of Long Island for the first time. It converted me. I am no longer a snob about American wine. Well, wine from the East Coast anyway. 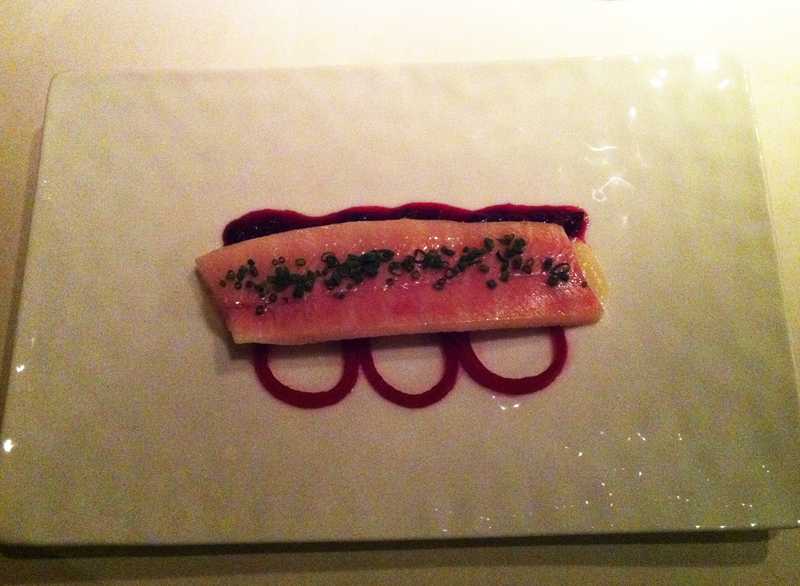 This entry was posted in Food, Uncategorized and tagged Gramercy Tavern. Bookmark the permalink. Great to hear Tonita and snap on husband birthday celebrations!